4chan regulars, who like the site because of its vast pool of images that get uploaded to the website every minute, often utilize software or extensions to download images automatically, or at least semi-automatically from the popular Internet message board. 4chan Downloader is on first glance just another tool for the job. The program takes a single url that points to a 4Chan thread, scans it for images and downloads them automatically to the selected location on the local hard drive. But there is more to the software. The software can for instance be configured to automatically rescan the 4Chan.org thread to find and download new images that have been posted since the time of the last download. Many images are shown as thumbnails in the program interface. Many? Yes, not every image is shown there. I'm not sure if this is a bug or a limitation. The screenshots on the project page paint a different picture. It is not a huge problem but makes the software look inconsistent. All images, regardless if a thumbnail is shown or not, are downloaded to the local hard drive. They can be opened from within the program interface, or from the local directory they have been downloaded to. 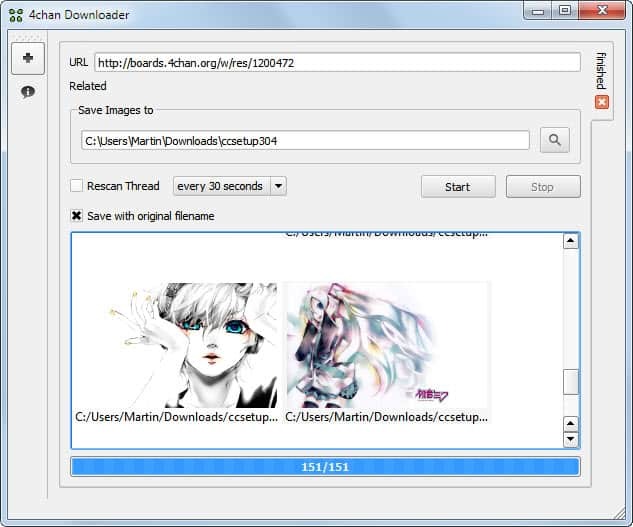 Another interesting option is to create a new download tab to download pictures and images from a different 4chan thread as well. A user could theoretically create download tasks for an unlimited amount of 4chan urls. On top of that, all could be monitored by the application for new images. What's missing? The developer needs to work on the thumbnail display. Either display all images as thumbnails or none, the current solution is not satisfactory. An option to add multiple threads at once, or a whole board, would be welcome as well to automate the downloading further. 4chan Downloader is a portable Open Source software for Microsoft Windows PCs and Linux. Downloads are offered at the Sourceforge project website. Is there a way to automate the download of all image from hr board? however this download only images displayed in pages, not in thread, so if a thread get a bunch of images in a few minutes only thi first one and the last 3 are saved. The good thing of wget is that it doesn’t download images already present on the disk minimizing the bandwidth usage. Yes but how do I start the thing?